Reza Aslan is an important type of thinker, putting him in a category, for example, with Steven Pinker. That is, he brings to his argument a wide range of fields of research, from which he attempts a synthesis that leads to a credible conclusion. In the work in question we read of the history, psychology and sociology of religions as well evolutionary theory, philosophy, mysticism, and in the end, a theological proposal. Scholars who spend their lives working within a narrow field often think of such writers as dilatants, though that may be explained by the fact that synthesizing of this kind is beyond their capacities. There is a lot in this book that will surprise, perhaps even shock, those who consider themselves religious in the traditions of Moses, Jesus and/or Muhammed, but have not read much of religion's history. I think of the fact that the some of the most important stories of the Torah (Aslan refers to it by its Christian name the Pentateuch) trace to far older Sumerian myths; that scholars have identified four different writers of the Torah; the so-called J, E, P and D writers, each writing at different times and with different agendas; that the Hebrews of the Torah, though committed to only one divinity, believed that there were other divinities as well; that the claim of Trinitarian Christianity, not to mention Saint-devotion, to being monotheists is certainly suspect; that it was not until four hundred years after the date given for Jesus's death that Christians settled upon the idea that Jesus was in every way divine and in every way human (a concept that the great Christian thinker, Soren Kierkegaard, referred to as the "crucifixion of reason. "); that Muslims fully accept the Hebrew and Christian scriptures as divinely inspired (though corrupted over time); that in fact there are capable scholars who see Islam as an off-shoot of Judaism in the same way that early Christianity was. Aslam refers to Islam as replacing the polytheism of the region with ". . . the Jewish God." But Aslan employs this history, not for its own sake, but to further a theological argument, a view about what it really is that the Abrahamic religions and many others as well, are striving to articulate. He argues that religious belief is, at its basis, innate, that human children are born with a propensity to believe that people have, in addition to their bodies, a soul, defined roughly as something "within them" that survives the body's death. He cites literature from developmental psychology, archaeology and the earliest religions to support this idea. This leads to the conclusion that there are elements of human brains or human DNA that, under a broad set of environments, have led to the creation of religions. This seems to Aslan to be an important conclusion, if not justifying religion, at least rendering it all-to-human. In fact, though, it's a quite trivial idea. All human traits have a genetic (as well as environmental) basis. It's simplistically true to claim that some existing trait (height, eye color, shyness, greed) is partly a consequence of one's DNA since there is always going to be, for any trait, arrangements of DNA without which the trait would not exist. It's very close to the claim that since in fact people have noses it must have been possible for them to have noses. DNA in concert with particular environments makes an existing trait possible, and in different environments the same DNA can make it impossible. And, of course, there are traits that individuals have at birth and later dispense with, for example, see Piaget's study of the early childhood idea that objects outside themselves cease to exist when out of view. Aslan seems to imply that a propensity for an idea in early stages conveys legitimacy to the idea. But think of the infantile idea that mother is a "being-for-me" only, common in early childhood and later (one hopes) sluffed off. Aslan argues as well that the infantile tendency to attribute a soul to humans, a soul that exists independently of and post-dates bodies, is the conceptual seed that leads to the idea of surviving human death and ultimately to non-human spirits or gods. Compare this to two other ideas about the origin of the concept of the divine. Augustine of Hippo proposed that god created humans with a drive to be unified with God, "our hearts are restless, Lord, until they rest in thee." This, to him, explains the existence of religion. The Creator placed in every human a desire, sometimes realized and sometimes sublimated, to be unified with the Creator (however one understands such a unity). In The Future of an Illusion, Freud proposed that as tribal societies led by stern fathers began to break up, the freed sons of the father created the idea of a divine Father to become law-giver to replace the deposed dad. 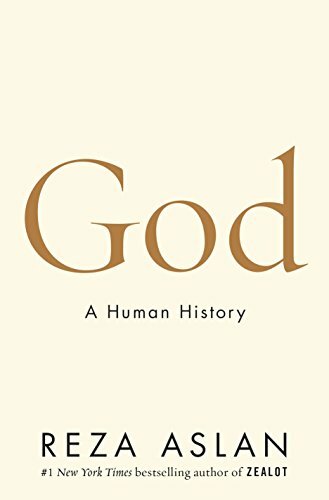 Augustine' story begins with God, Freud's with (rather recent) history and Aslan's with the evolution of the human species. Evolution is frequently understood as an enemy of religious commitment, but this is not the case for Aslan. He understands himself as a religious person, though not one who accepts the harsh but merciful Man-Beyond-the-Sky found in the Abrahamic traditions. In what way Aslan is religious is not easily pinned down. The great German philosopher G.W.F. Hegel (died in 1831) claimed that, of all world religions, Christianity represents the highest, closest to the truth, stage. This is because, he thought, the concept of Jesus as God-Man, while not to be taken literally, is the fullest recognition of the divine nature of the human. A generation later Soren Kierkegaard (died 1855) derided Hegel first for reading the Jesus story as symbolic myth and second for suggesting that the human (mortal, imperfect, finite) could consistently be also divine (eternal, perfect, infinite). "Revoking the principle of contradiction" as Kierkegaard claimed in so many words. And I do think Hegel was "pulling a fast one" in this case, rather like proposing a two-dimensional figure with all the properties of both a circle and a rectangle. To the degree that it's a rectangle there cannot be a point within the figure equidistant from every point on the figure's perimeter. Let's look at Reza Aslan's God. Aslan reads the history of religions as moving from polytheism (worship of many non-human gods) to henotheism (worship only one god among many non-human gods) to monotheism (worship of the only one non-human god there is) to Pantheism (worship of one god whose existence is inextricably bound to the universe or perhaps the idea of god as a universe-pervading spirit.) I doubt that this stage theory of religious history, even as one of fits and starts, would stand up to historic scrutiny (for example by Jesus' time Judaism was a strict monotheism while its later offshoot, Christianity, is arguably a de facto, practiced as, polytheism.) I am interested in whether Aslan has revoked the principle of contradiction. As early as his Introduction, Aslan states that humans have a, "… compulsion to humanize the divine …" which, "… is hardwired in our brains …"
In the end, the author's search brings him to pantheism, the idea that god exists, not separate from human, material, organic and inorganic things; from planets, stars and galaxies, but as a permeating spirit, as an indivisible One linking all the many. I cannot report that I know what this means. It reminds me of the recent, "I'm spiritual but not religious." I have trouble with that too, a seeming claim that there are three types of people: (1) the spiritually religious, (2) the spiritually non-religious and (3) the non-spiritually non-religious. I wonder how 2 and 3 differ. I supposed it has something to do with the difference between matter and spirit and whether one believes in the latter. But we shouldn't pretend yet, as a species, to know the what either matter or spirit is, how they differ, if at all, or how they interact if they differ. So Reza Aslan's book leaves me confused as to what he recommends, but I don't hesitate to recommend it as a well-written, informative and enjoyable account of many features of the religious. John Mullen is that author of the widely-read, Kierkegaard's Philosophy: Self-Deception and Cowardice in the Present Age as well as the recent novel, The Woman Who Hated Philosophers.